Reviewing the recently finished Rider series. what do you think of power rangers samurai? While I agree that it would have made for better drama to leave Phillip dead, I do have to say that at least they didn't full on asspull with him. I mean, it was wakana's sacrifice that brought him back. something lost, something gained. still b.s. but not completely. On the OOO ending, Maki was great, but I didn't really feel as much threat with Uva going out of control. Yeah, buildings and stuff were being destroyed; but imagine how much more heavy it would have felt, how much more urgent, if it was actual people being turned into medals. Hell, the last ten episodes felt rushed. Yes, there was good pacing, but not great pacing. They doddled far too long trying to stretch out Ankh's story. While it was the best part of OOO, they did most of the major character work nearer to the end. And W was still pretty well paced too, while they kept to the two episode format for pretty much the whole thing, like OOO there always seemed to be something happening with either the heroes or the villians. One thing that some folks complained about was how they could see from a mile away that Phillip was Raito; however, it wasn't our knowing that was important, but his discovery and realization. In sort, I feel that W dropped the ball mostly on the final villain and OOO dropped the ball in that it push much of the most interesting parts to the later 10+ episodes. BUT STILL!!! they both, despite their problems, are still among the better riders over all (at least since kabuto, still need to finish watching the first half of the heisei riders, so can't count them yet). Kiva: Last episode was rushed, hell the last arcs felt kinda wonky, but over all fun. Ixa is still my most favorite of 'second riders'. Still, the Megumi/Nago thing was damn rushed. Decade: (or "kamen rider: the fanfic". Started promising, ended terribly. Much like many of the better fanfics. W: Great, good pacing, fun characters. Should have toned down Akiko's silliness sooner, and built up Utopia more as a villain if they really did want to make him the endgame baddie (funny thing that, I never felt terror was going to be the final villain. Something about Ryubee gave me the feeling that he would turn good later, though that never did totally come to pass... and did you forget the damn terror dragon? freaked me out. yeah it was still less then he should have gotten, but i still felt the threat he posed.) Despite the final enemy being crowbared in at the last minute, I loved 48. Shoutaro's growth coming to a head when he takes up the fedora and faces Utopia with little more then his guts and the dinky memory devices that have been useful but not very powerful through out the series. Damn, I love that seen a lot. OOO: Better balance of characters (though I do agree they never really followed through on Eiji's story, hell, I didn't feel they fully followed through with a lot of the possibilities for OOO as a rider, but this is getting too long already). Great final episode, though the threat to the world wasn't as heavy as it could have been. I consider this talk very smooth and I pretty much agree with you TJ, but I rank OOO a bit higher than five and with Eiji's fool factor in this show being the stumbling hero wasn't a bad step for Toei, It's a hero in training even if he is 40 episodes in. He wanted power but I'm sure he doesn't understand the concept of power. This is just my opinion on the matter. As for the next talk I think we should talk about Transformer Armada. I would honestly love to hear your opinion on the more modern non-action based cartoons, like Adventure Time or Foster's. Something to give a better feel of what you like in general (as in, when their aren't swords or lasers involved... at least not as the primary focus). Not asking you to do My Little Pony: FiM or anything, but a change of pace would be excellent. Well honestly since you asked. I would love to hear your thoughts on Prime, but I know you'll get to that eventually. I'd actually love to hear your thoughts on why you love Agito the most. I myself hold Agito in the highest regard, actually just recommending it to a new toku watcher. But I didnt expect to hear you say it. So I want to know WHY Agito? Again I think it would be fun to see a "Talks" on something negative. Like Voltron, or PR: Samurai, or Goseiger. I've watched a couple of episodes of Agito and found it really quite boring and hard to get into. 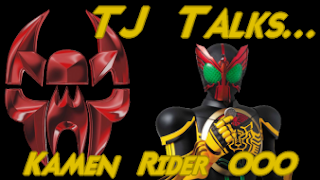 I know TJ Talks is for more recent stuff, but I would like to hear your thoughts on why you like Agito. I would eventually like to see a video on Kaizoku Sentai Gokaiger, seeing as it's in the latter half of the series now. So a TJ talks for that once it's done should be good! For more recent stuff, I'd like to see you talk about MLP:FiM or Avengers: Earths Mightiest Heroes. I'd be curious to hear what you like about Kabuto, because I haaaaaaaaaate that show. Man, you summed up OOOs for me. I agree with you all the way, especially on Eiji and Hina. I swear, though, I can't rank the Kamen Rider shows. Having watched Kabuto, W, Fourze, and OOOs, I still can't choose. I would be curious to hear what you think makes for a good (or merely watchable one, whichever applies) adaptation vs. why certain adaptations (have) fail(ed) in your opinion. I will be tactful and NOT mention names here, but I am just curious. Are you talking about when Kougami (in about episode 3) was explaining something grander than infinity then adding an o to make OOO? If you have seen them, how about talking about Tomica Hero Rescue Force or Garo? Can your next TJ tv be on M.A.S.K. or Votron? I loved this show so much that I bought every one of its mainstay figuarts. I love how artful the entire thing was, and I'm sure it would be able to do so much more with more episodes, even if it could be just two more eps. I do agree that the hero should be evolving -heck even shinji from Ryuki was becoming more badass with each episode- but you have to agree that Eiji did surprise the viewer with several clever counterattacks. Okay; first of all, you made a very good point for Eiji not exactly growing as a character. Really...even in the movie you mentioned (minor spoiler) he doesn't seem that much different than the series as a whole (although in that movie this was something of a highpoint, as it meant that part of the movie resembled the series). OOO is indeed a good series with a bittersweet ending that feels like it deserved such, but there is one thing that makes it a tad inferior to Den-O comparatively - the victims of the villains of the week. This was something you didn't touch on, which I was surprised by. In Den-O, I felt that most, if not each character who was affected by an imagin got some kind of closure as far as we saw. Some sign of when would come after (if they didn't treat it as some kind of nightmare). Not all of them were perfect, but it didn't weigh on me in the end. In OOO...not so much. A lot of the stories about greed and such, while having some truth in them, didn't really connect with the episodes themselves. One glaring example of this was in the episode where we actually get a part of Eiji's backstory, when a guy who was a shut-in was brought out of his shell by Eiji, made a park...and was never brought up again later on despite the fact that his involvement in the episode seemed to just be "betray because these bad people say so". I never got a handle for what this character learned, and it just fell flat. The guy just felt...flat. But all in all, I agree with what you said. As for Kiva...no, thanks, I kind of gave up when we got to the Frog Fangire who was so dumb to not try and move out of a loud city that could trigger him at any moment and was simply standing around in the open with only ONE set of headphones to a CD player. And who apparently couldn't notice a band setting up and playing in the same area as he was. Just...no. Now that Fourze's finished, think you can give your opinion on it? "Sorry, we're unable to play this episode."